Do you have something broken? Need an installation? Or just need help finishing that special home improvement project? Need new fencing or decking? Then the HOUSTON HEIGHTS HANDYMAN is here to help! Busy schedules can make home repairs hard to get to. Now your growing “To Do” list just looks overwhelming and unmanageable. Where do you start? It takes just one quick call to hire your local Heights Handyman to solve all your home repair headaches. Professional, safe, reliable handyman services on-time, every time, that’s our guarantee. 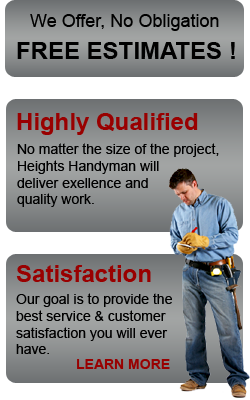 The Heights Handyman in Houston Tx is your “one-stop shop” to all your home repair and project needs. As long-time homeowners and residents of the Houston Heights, we understand both the time and cost involved with keeping one of the biggest investments most people ever make in tip-top shape. All too often minor “fix-its” lead to major repairs, costs, headaches, and sometimes devaluation of the investment in your home if not completed in a timely manner or improperly. Or, you may undertake these projects as weekend DIY-er only to create a larger headache. That’s why we strive to deliver quality work that is guaranteed to help you better enjoy the investment in your home and spend more time with your family. We specialize in the older homes located in and around the Historic Houston Heights District, Parts of the inner loop, Montrose, Garden Oaks, but conduct business all throughout the surrounding areas. For all questions, please visit our “Contact Us” page and you will find several ways to get in touch with us there. We look forward to working with you.